The 'Ick' Factor: Bugs Can Be Hard To Swallow Lots of creepy crawly things will appear on doorsteps and fence posts for Halloween, but will they be on your dinner plate? Insects are being proposed as a cheap and environmentally friendly food source. Long accepted around the world, eating bugs is considered, well, gross to many in North America and Europe. When it comes to creepy crawly things on your dinner plate, getting past the "ick" factor is the big hurdle. Entomaphagy — eating insects — is common in most of the world, but in North America and Europe it's considered, well, gross. Now it's being proposed as a cheap food source and a way to save the planet as the world population explodes. Crickets need less feed, less land and emit fewer greenhouse gases than cattle. Nate Erwin, manager of the Insect Zoo at the Smithsonian's Museum of Natural History, says grasshoppers are 60 percent protein and about 6 percent fat, while beef is about 18 percent protein and 18 percent fat. For 100 pounds of grain feed, he says, you'll get 10 pounds of beef, but 45 pounds of crickets. Plus, crickets are high in calcium. Before the colonists showed up, Native Americans had no problem with the occasional bug buffet. Then we domesticated all those big farm animals and now eat insects only when we don't know it. Since it's impossible to get every tiny bug out of food before it's processed, the Food and Drug Administration sets limits. So frozen spinach is acceptable with a few mites and larval fragments. Think of it as extra protein. Tempted to taste insects? Here are a few guidelines. If you are allergic to shrimp, shellfish, dust or chocolate, do not eat insects. All arthropods — a classification that covers many insects and crustaceans — share a common ancestor. Brightly colored insects could be inedible, so know what you're eating. Insects are available online, at pet stores and bait shops. Cook bugs before you eat them. Eat-a-Bug Cookbook: 33 Ways to Cook Grasshoppers, Ants, Water Bugs, Spiders, Centipedes, and Their Kin by David George Gordon. The rest of the world is far less squeamish about eating bugs. They eat palm grubs in Uganda, fried dragonflies in Indonesia and tarantulas the size of dinner plates in Venezuela. 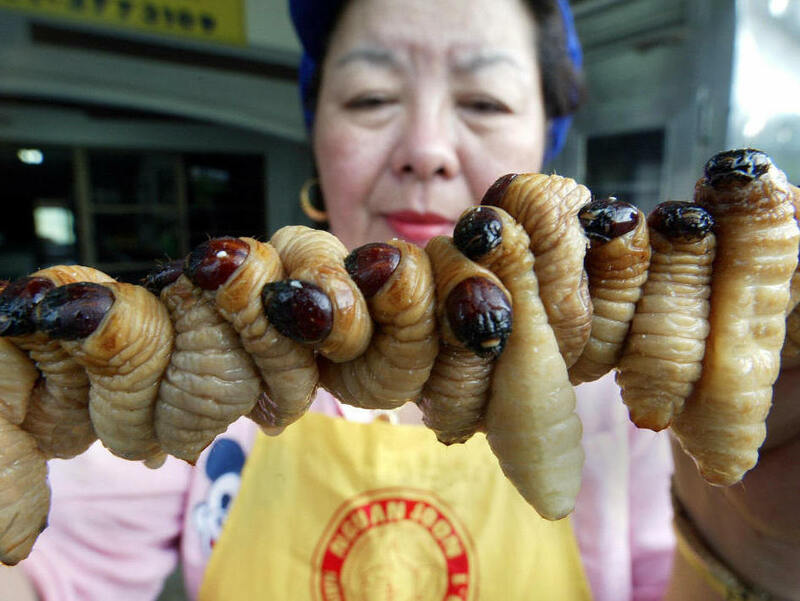 China has a huge insect menu, including water beetles marinated in ginger and soy sauce, deep-fried scorpions on crispy rice noodles and caterpillar fungus soup. Yet there have always been bug eaters among us. In the 1990s, the Insect Club in Washington, D.C., served dry-roasted crickets along with the party mix. Even today, you can get a good grasshopper taco in D.C.
Erwin says he and his insect zoo colleagues like a good bug feast. During the last 17-year cicada invasion, they fried them, roasted them, sauteed them and dipped them in chocolate. It's all mindset. Hissing cockroaches molt, like soft shell crabs. Which are you more likely to consider a delicacy? Does it help to know that hissing cockroaches have a diet of fruits and vegetables while crabs are bottom feeders and cannibals? Probably not. Every year, the Anthropology Club at Washington College in Chestertown, Md., has a pre-Halloween insect bake sale. This year it was cicada nachos, grasshopper kabobs and rootworm beetle dip. The club's goal is to show that insects can be party food, not just something on Fear Factor. It wants to help people get beyond the "ickiness." NPR commentator and Kitchen Window contributing editor Bonny Wolf is working on a book about the foods of Maryland's Eastern Shore. Grasshoppers are commonly eaten throughout the world. This recipe for grilling them is adapted from Eat-a-Bug Cookbook: 33 Ways to Cook Grasshoppers, Ants, Water Bugs, Spiders, Centipedes, and Their Kin by David George Gordon, and used by the Anthropology Club of Washington College in Chestertown, Md., for its pre-Halloween bug food sale. Mix the first six ingredients together for the marinade in a nonreactive baking dish. Add the insects, cover and marinate overnight. When ready to cook, remove the insects from the marinade. Pat them dry, for ease of handling. Assemble each kabob, alternately skewering the insects, peppers and onion wedges to create a visually interesting lineup. Brush the grill lightly with olive oil. Cook the kabobs two or three inches above the fire, turning them every two or three minutes and basting them with additional olive oil as required. The exact cooking time will vary, depending on the kind of grill and types of insects used. However, the kabobs should cook for no longer than eight or nine minutes. From the Washington College Anthropology Club. Worms: Boil them with ginger, garlic, shallots, chili pepper and coconut milk. Stir fry.